Our Square Insulated Bags offer a nice neat presentation at point of sale with a simple straight zipper across the top for closure. It’s more affordable than our Full Zip Insulated Bag but has many of the same great features, including three layer construction: exterior NWPP, insulating foam, and reflective aluminum lining. Keeps food hot or cold up to 2 hours. This is an easy way to add variety to any bag selection. More variety helps sell more bags. Customize these with your brand and help your customers have the choices they want. Available in quantities of 1000. Lead time approximately 10-12 weeks. This is our original eco-friendly insulated bag. It’s affordable with branding on both sides and our one-color imprint on both sides. Nice and neat for retail presentation, it’s roomy and strong. The insulation keeps food hot or cold for up to 2 hours. This bag helps you offer variety in your bag selection, which improves sales overall. It’s also a great shopping bag for a meat market, ice cream store, and other specialty stores that sell temperature sensitive items. As an all purpose eco-friendly grocery bag, it’s perfect for larger food items like watermelon and other melons, drinks and other heavy foodstuffs. 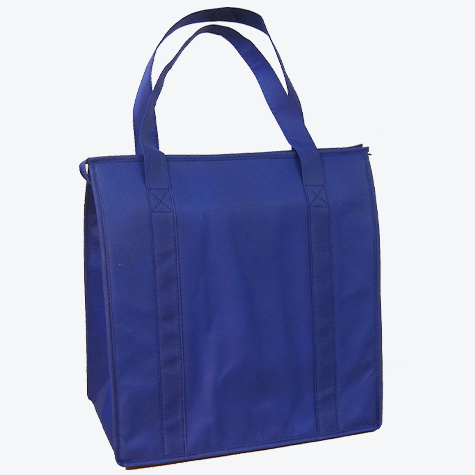 Our insulated bags feature three layer construction: exterior NWPP, insulating foam, and aluminum interior. The simple zipper straight across the top is easy to close and keeps temperatures inside. It also helps keep items inside the bag, no spilling on the way home. Some customers prefer to use them for every day grocery shopping over NWPP bags. We have a range of insulated bags for you to choose from. Check out our Insulated Full Zip Bags or our handy Insulated lunch bags. We can even custom design a bag for special events or products. There’s a style that is sure to be right for you. Contact us today for a quote.